Hurricane Irma became a Category 5 storm early on Tuesday and is one of the strongest Atlantic hurricanes in history. 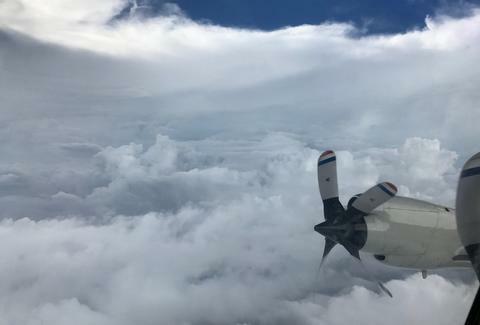 The National Oceanic and Atmospheric Administration's "Hurricane Hunters" braved the storm's intense winds to show off the "stadium effect" inside the eye of the storm. The effect gives the impression of an open stadium with the blue sky above and a smaller opening down toward what would be the field. The Air Force Reserve's "Hurricane Hunters" also took to the sky and shared images from the eye. The images are striking. Those clouds leave an impression, but the images might not portray just how dangerous the storm truly is. The winds outside the eye are moving 175mph. That's far beyond the threshold for a hurricane to become a Category 5 at 157mph. Similarly awe-inspiring are images shared from the International Space Station, showcasing the massive meteorological event from space. The storm continues to move westward toward the Leeward Islands and may strike land as soon as Tuesday evening. Also on its current projected path are the British Virgin Islands, US Virgin Islands, Puerto Rico, and the US. Florida has already declared a state of emergency and officials have begun mandatory evacuations in the Florida Keys. Here are tips from NOAA on preparing for the hurricane.